There are several online casino games that have been specifically created for the Halloween festivities. We have collected the best video slots that we think can make your Halloween a bit more spooky, yet fun! Choose the right video slot to play on by analysing the theoretical return to player percentage, high maximum coinciding win and game features available! So have gone out of our way to provide you this list of video slot and their specifics. Halloween Jack™ is the latest NetEnt video slot which will be released on the 24th of October 2018. As always, NetEnt develops great casino games to offer the best casino gaming experience to the players. Halloween Jack™ is packed with game features including; Multipliers, Free Spins, Walking Wilds, Re-Spins, 2-stacked Hell Hound Wilds, 3-stacked Jack’o’Lantern Wilds and Expanding Death Reaper Wilds. The theoretical RTP of Halloween Jack™ is set to 96.28% with a maximum coinciding win of 600,000 coins. Click here to read more about Halloween Jack™ video slot! Blood Suckers II™ was released by NetEnt on the 12th of October 2017 for the same occasion. The predecessor slot is obviously the very well renowned Blood Suckers™ which we will come to later. Blood Suckers II™ main character is a young vampire Amelia that is in search of the hidden treasure in the vampire’s castle. The theoretical payout percentage of Blood Suckers II™ is set to 96.94%. The maximum coinciding win on Blood Suckers II™ is €324,600 and a hit frequency set to 40.70%. Check the full slot review on Blood Suckers II™! Blood Suckers™ still ranks as the highest paying video slot that Netent has ever developed and it’s still one of the most favourite online video slot amoung online slots enthusiast. The theoretical payout percentage of Blood Suckers™ is set to 98.00% with a maximum default win set to €90,000. This is one of the first releases by Netent, so do not expect the same level when it come to graphics, but you can surely get some bloody big wins when slaying those vampires! Click here to read more on Blood Suckers™! Wolf Hunters is the latest Yggdrasil Gaming video slot, released on the 24th of October 2018. This amazing video slot is based on 2 werewolf hunters armed with Holy water, Silver bullets and Bear traps to defeat the evil beast. Players can find some amazing slot features including; Rage Free Spins, Slayer Free Spins, Scatter Free Spins and Wild Multipliers. The theoretical payout percentage is set to 96.30% and players can win up to 3,000 times the bet amount. Click here to read the full slot review on Wolf Hunters! Pumpkin Smash was released by Yggdrasil Gaming on the 24th of October 2017 in celebration of the last year’s Halloween. The theoretical payout percentage of Pumpkin Smash is set to 96.20% and a hit frequency set to 30%. The game features available in Pumpkin Smash are Pumpkin Smash bonus game Free spins, Pumpkin Smash bonus game and Multipliers. Click here to read the full slot review on Pumpkin Smash! 50 No Deposit Casino Bonus Spins at Casino Room! Join Casino Room and claim 50 no deposit free spins to play on several Netent slots. The free spins are credited in batches of 10 for 5 consecutive days and can be played on the following slots: Butterfly Staxx, Twin Spin, Gonzos Quest, Aloha! Cluster Pays, Joker Pro, Jackpot 6000, Guns n Roses, Jack and the Beanstalk, Pyramid – Quest for Immortality and Dazzle Me. 100% up to £$€200 + 100 Spins at Mr.Play! Join Mr.Play and get a 100% match deposit bonus up to £$€200 + 20 spins on your first deposit! Make you second and third deposit and get rewarded 40 spins on each deposit! At Mr.Play you can find your favourite games, including the Blood Suckers II™ and many other video slots and live tables powered by the following games providers Play’n GO, NetEnt, Microgaming, Playtech, Betsoft, NYX Gaming, Evolution Gaming, ELK Studios, Thunderkick, Quickspin and more…. Click here to join Mr.Play and claim your deposit! 11 No Deposit Spins on Netent Slots! Let the fun begin at Fun Casino! Get 11 complimentary spins to play on one of the the following Netent slots Starburst, Joker Pro, Wild Wild West or Finn & the Swirly Spin. The no deposit offer on registration is available for players residing in the following Countries: United Kingdom, Austria, Canada, Germany, Finland, Ireland, Norway, Sweden, India, New Zealand, South Africa and Switzerland. 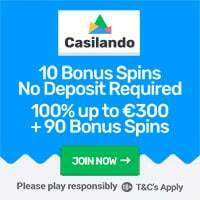 Get a First Deposit Bonus of 50% up to €/$499 + 100 Spins! Get a Second Deposit Bonus of 50% up to €/$499! 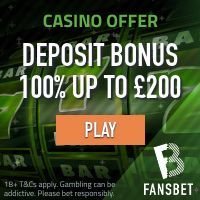 The casino spins on the first deposit can be played on one of the following games: Starburst, Joker Pro, Wild Wild West or Finn & the Swirly Spin! 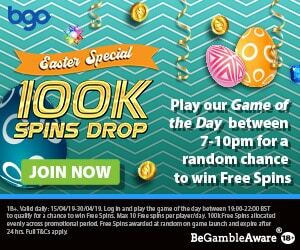 Click here to claim your 11 spins at Fun Casino! Get 25 Casino Spins at Slotty Vegas! Join Slotty Vegas Casino and get a complimentary bonus of 25 spins to play on Starburst video slot! Players have to wager the no deposit spin 30 time before converting the bonus into real money. Make a deposit between the 26th of October until the 30th of October and you will get a match deposit bonus plus extra spins on the latest Netent video slot Halloween Jack! Opt in is required. There will also be a raffle which will take place on the 31st of October 2018. Opt in using the promotional code: GOBITSY. Make a minimum deposit of €20.00 and you will get €5.00 bonus + 10 FS on Halloween Jack. Wager €75.00 on slot games and you’ll receive 15 Extra Spins on Halloween Jack. This promotion does not qualify for the raffle. By opting in to the following offer, players will automatically participate in the Halloween Raffle where you can win a next-gen gaming console! Claim the promotional code: GOROT and make a minimum deposit of €25.00, to get €10.00 bonus + 20 extra spins on Halloween Jack. Wager €300.00 on slot games and you’ll receive 50 Extra Spins on Halloween Jack. Claiming the promotional code: GOSLIM will also enroll you into another raffle where you can win a gaming console and smartphone! Deposit a minimum of €50.00, get a €25.00 bonus + 25 FS on Halloween Jack. Wager €500.00 on slot games and you’ll receive 50 Extra Spins on Halloween Jack. Click here to register an account at Slotty Vegas and claim these fantastic spooky offers! Visit Halloween Island at Casino Heroes! Play any slot of your liking between the 29th and the 31st of October 2018 and go through the 3 regions which contain 3 Bosses to defeat. For each region you conquer, you’ll earn Casino Spins or Rubies on some of our most popular Halloween-themed slots! On the first four deposits players can claim fantastic match deposit bonuses or casino spins. To get more information on the welcome offer available in your Country click here! Click here to start your journey at the Halloween Island! « New EXCLUSIVE Welcome Bonus at Yako Casino!